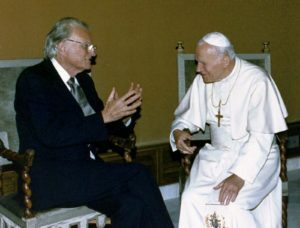 Billy Graham, who became well-known for his various crusades across the U.S. and around the world, and who served as a counselor to numerous presidents, including Gerald Ford, George H.W. 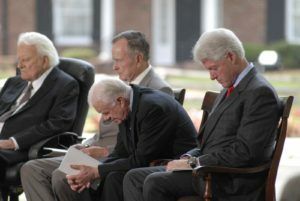 Bush, George W. Bush and Bill Clinton, has died at age 99. 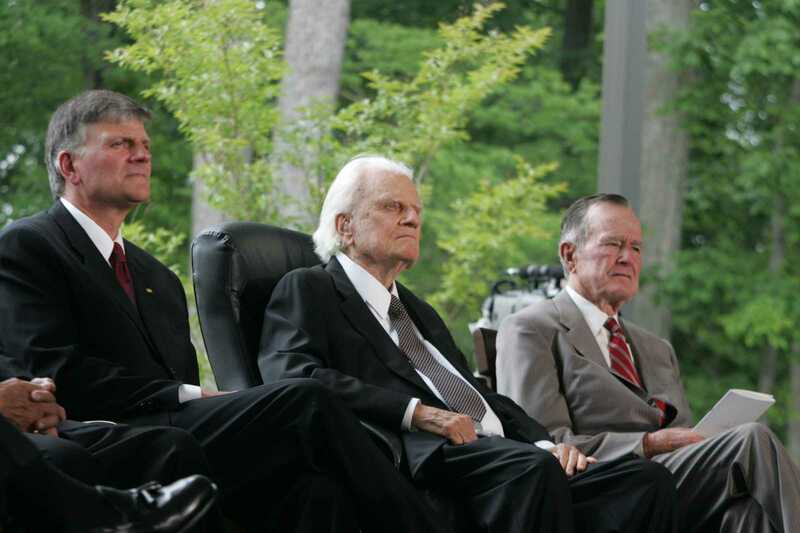 The Billy Graham Evangelistic Association announced on Wednesday that Graham died at 7:46 a.m. this morning at his home in Montreat, North Carolina. Graham, who had led hundreds of crusades since 1947, held his last event in 2005 at Flushing Meadows Park in New York, and delivered his final recorded message via television and the Internet five years ago. Graham practiced what is known as decisional evangelism through his altars calls, a method that some churches have discontinued out of the belief that man cannot make a mere decision for Christ, but must be truly regenerated. Since 1955, Graham has regularly made Gallup’s poll of the “10 Most Admired Men in the World,” being listed 61 times. 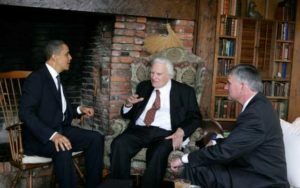 Graham, reported to be a registered Democrat, is stated to have prayed with every president from Harry Truman to Barack Obama, the latter of whom traveled to Graham’s cabin in 2010. In 1983, he was presented with the Presidential Medal of Freedom by President Ronald Reagan. Some expressed concern over Graham’s practices and affiliations for this reason. Statements made during a 1997 appearance on Robert Schuller’s “Hour of Power” also drew questions from Christians, even to the time of his death. During the broadcast, Graham suggested that Muslims and those of other religions may be saved without hearing of Christ or reading the Scriptures—just by realizing that they “need something,” although not pinpointing what it is. “And I think that they are saved, and that they’re going to be with us in Heaven,” he declared. Schuller then sought clarification on Graham’s remarks. “What I hear you saying that it’s possible for Jesus Christ to come into human hearts and soul and life, even if they’ve been born in darkness and have never had exposure to the Bible. Is that a correct interpretation of what you’re saying?” he asked. “How do you feel when you see a lot of these strong Christian leaders go on television and say, ‘You are condemned. You will live in Hell if you do not accept Jesus Christ,’ and they are forceful and judgmental?” King asked. Christian News Network had previously tried to obtain clarification on Graham’s “Hour of Power” remarks, including whether or not he still held to the belief, but efforts to receive a clear answer were unsuccessful.